The 10th International Young Scientist Conference “Developments in Optics and Communications” will be held in conjunction with Laserlab III Training School for Potential Users “Laser Applications in Spectroscopy, Industry and Medicine”. The event will take place on April 9 – 12, 2014 in Riga, Latvia. The conference “Developments in Optics and Communications” brings together young scientists and students working in the fields of optics and photonics to share ideas for research and to establish contacts for future collaborations. The mission of the Laserlab III Training School is to introduce networking opportunities for laser scientists in Europe. The training school will feature laboratory exercises for graduate students and young scientists at research facilities. Early application is strongly encouraged, as the number of participants in the laboratory exercises is limited. Please, note that final schedule will be adjusted in accordance with the demand. A seminar explaining opportunities offered by the Laserlab network and giving practical advice on joining the network will take place during the event. The final programme will be announced on February 28, 2014. Limited amount of travel grants covering travel expenses and accommodation will be available to international graduate students. 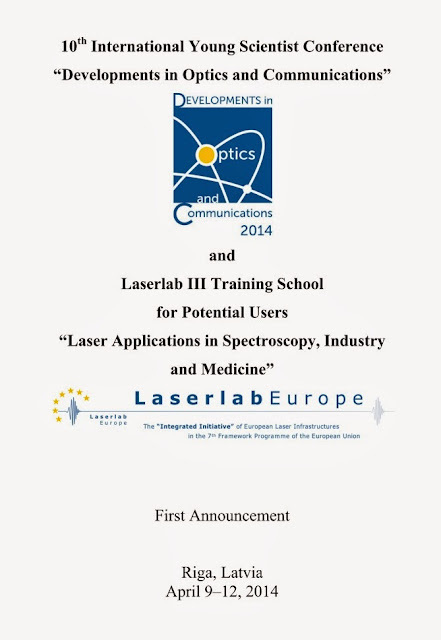 To be eligible for the support you are required to participate in the Laserlab training school. To apply for the support please contact the organizing committee before 31st January.